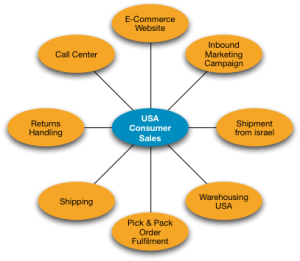 An e-commerce and fulfilment service to help Israeli companies easily reach US consumers. Helping you sell direct to US consumers! A marketing team to determine the market strategy and the right way of doing business in the USA to ensure a great ROI. A development team to create and maintain a stunning website and online store. An inbound marketing team to drive traffic to the website, make sure visitors generate sales and to maintain customer relations to promote repeat business. A fulfilment and logistics service in the USA to maintain inventory, pack and ship orders, accept returns and manage a call centre. For companies who have only worked through distributors/resellers and are now thinking of direct sales, or for companies who have not yet entered the US market, we make it as simple and cost-effective to reach North American consumers. We will create a fantastic e-commerce website for you or add an online store to your existing website. Outsource the online marketing to us. We take care of promoting the website, lead generation, converting traffic to sales and building relationships with customers to increase order values and encourage repeat orders. Your products are warehoused in our US facilities and as orders are received, they are picked, packed and shipped to consumers under your own name. We handle all billing, invoicing and collection for you and provide access to inventory levels and order statuses through a convenient web portal. © 2019 WM Consulting Group All Rights Reserved.